Bob Perkins collected and reared a Shadow Darner dragonfly (Aeshna umbrosa) larva/nymph. This blog post features a focus-stacked composite image of a beautifully preserved specimen of the adult that emerged from the larva. This individual is a male, as indicated by his “indented” hind wings. 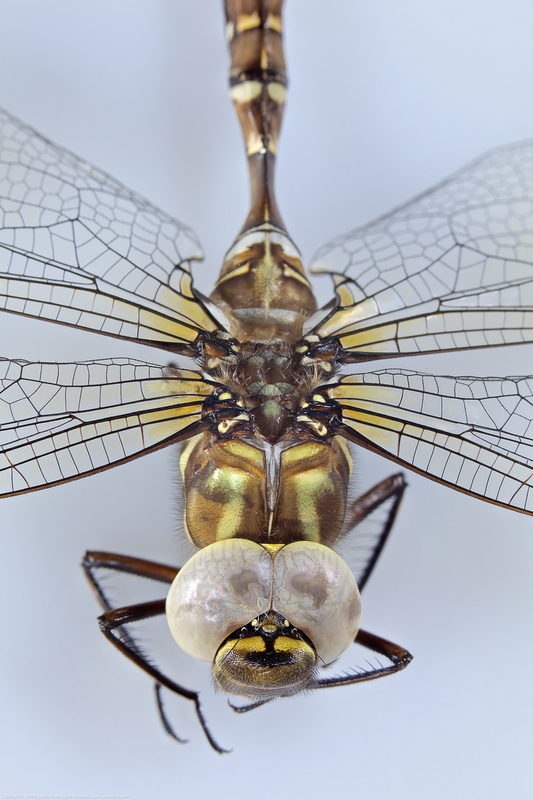 I shot 19 photographs that were used to create a focus-stacked composite image of the Shadow Darner dragonfly. There’s a lot going on in those photos that caused too many artifacts to publish the final output. Several of the more noticeable artifacts are shown below. Can you see three artifacts? I created another composite image; I used as many photos as I could before the first artifacts appeared. As it turns out, only five of 19 photos were used in the do-over composite image (shown at the beginning of this blog post). Look closely — some of the same artifacts are also noticeable in the do-over version. Test shots: Shadow Darner dragonfly. Test shots: Aeshna umbrosa exuvia. The following equipment was used to shoot the preceding composite image: Canon EOS 5D Mark II digital camera, in manual mode; Kenko macro automatic extension tubes (12mm, 20mm, and 36mm); Canon EF100mm f/2.8L Macro lens (set for manual focus); and Canon MT-26EX-RT Macro Twin Lite set for “Master” mode, and several external flashes set for “Slave” mode including Canon 580 EX- and Canon 580EX II Speedlites and a Godox TT685C Thinklite TTL Flash fitted with a Lastolite Ezybox Speed-Lite 2 flash modifier. How to Focus-Stack Macro Images using Photoshop, by Don Komarechka. This entry was posted on January 11, 2019 at 4:00 am and is filed under Aperture, Canon 580EX II Speedlite, Canon 580EX Speedlite, Canon EF 100mm Macro lens, Canon EOS 5D Mark II, Canon MT-26EX-RT Macro Twin Lite, digital photography, dragonflies, extension tubes, Godox TT685C, How To, Lastolite flash modifier, macro photography, natural science, Photoshop, wildlife photography. You can follow any responses to this entry through the RSS 2.0 feed. You can leave a response, or trackback from your own site.